Download a blank fillable Dd Form 1746 - Application For Assignment To Housing - 2010 in PDF format just by clicking the "DOWNLOAD PDF" button. 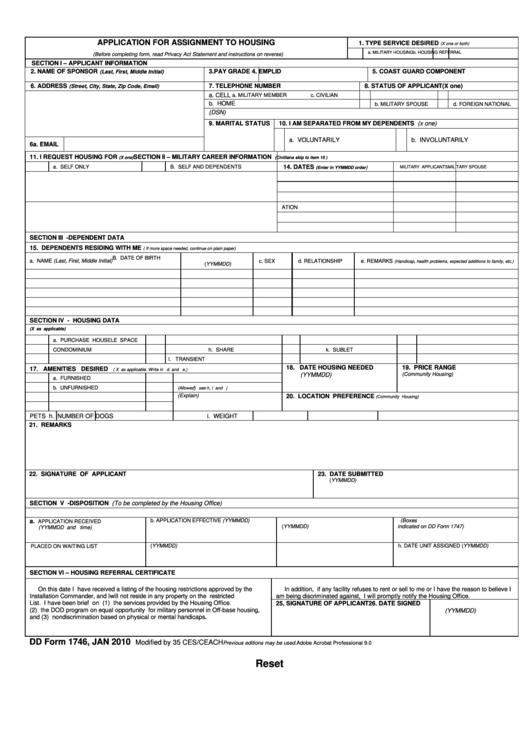 Complete Dd Form 1746 - Application For Assignment To Housing - 2010 with your personal data - all interactive fields are highlighted in places where you should type, access drop-down lists or select multiple-choice options. am being discriminated against, I will promptly notify the Housing Office. List. I have been brief on (1) the services provided by the Housing Office. and (3) nondiscrimination based on physical or mental handicaps. Previous editions may be used.